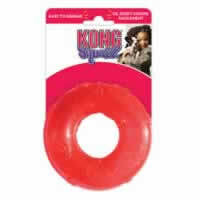 The KONG Squeezz Ring Large has a recessed squeaker that gives the safest and funnest squeak of any toy out there. Great for games of fetch, the erratic bounce and squeak guarantee tons of fun for you and your dog. Perfect for games of fetch. Made from durable non-toxic material. Comes in assorted vibrant colours so easy to spot. Not a chew toy. Supervised use only. Discontinue use if worn, loose or torn pieces occur.